Students who are lucky enough to have an 8 a.m. at Etcheverry Hall may have noticed something peculiar on the north side of campus. Every day, a perfect pile of unpeeled peanuts is placed at North Gate. Since our office is located just north of campus, members of The Daily Californian have taken note. So they sent the best department to investigate — here’s what the Clog found. First, we observed the pile for week, noting any significant changes to it. The peanut pile is replenished every day except Sunday. We couldn’t deduce the exact time the pile is restocked, but we can say for sure that it’s stocked sometime before 7:46 a.m.
After checking on the pile once every hour on the hour, we were able to determine that the pile is gone or mostly gone by 4 p.m. We don’t know what happens to all the peanuts, but eyewitnesses report that at least some of the peanuts are taken by squirrels. A smaller but not insignificant portion of the pile is poached by students. 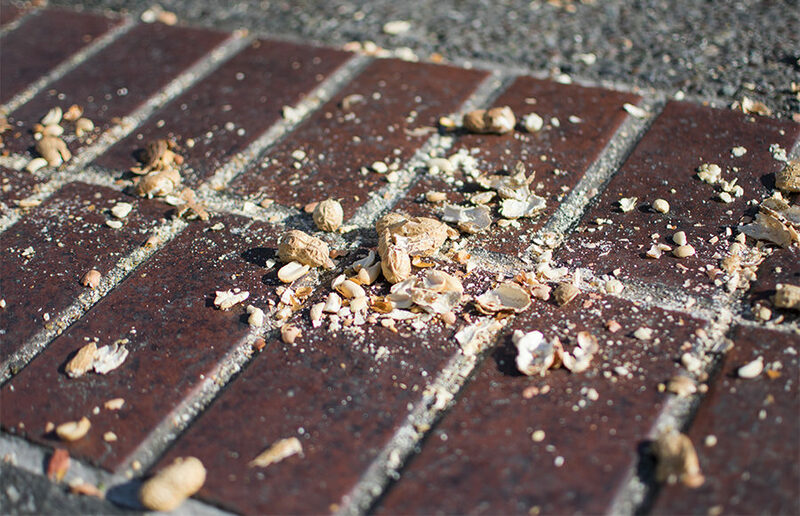 Aside from this, no leads have surfaced regarding the peanut pile, but the Clog will publish more information on this case as it develops.